I used to dislike quinoa. Not because it didn’t taste good – or that it’s good for me. It was because I associated it with someone I’m not a big fan of. I know, how lame does that sound? Poor, little, innocent quinoa just minding her own business, being a good girl and becoming collateral damage because of someone I don’t care for. Well, time has passed and I realized that I’m not being fair and I should give quinoa a chance. After all, what did quinoa do ever do to me? And I’m glad I gave it another chance. It’s like a whole new, happy world opened up. It’s delicious, easy to cook, filling, and awesome as a make-ahead meal. 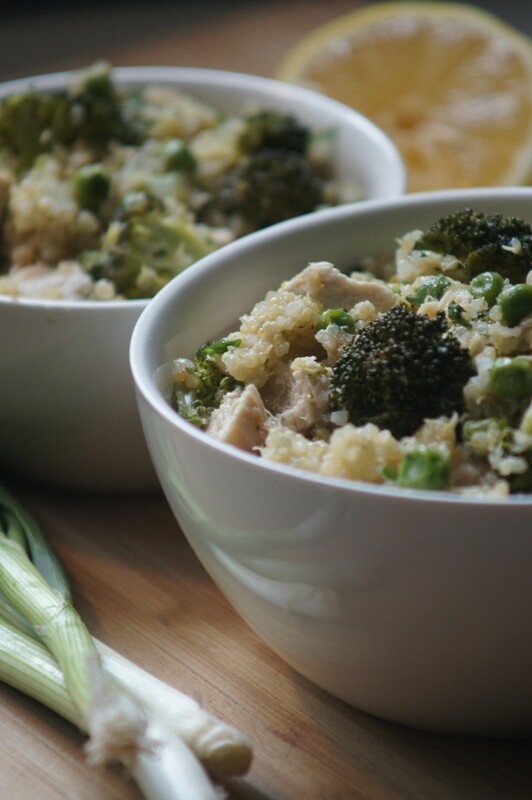 This particular quinoa recipe is excellent for meal prep for the week, it’s a one-pot meal, and most importantly it tastes so good! 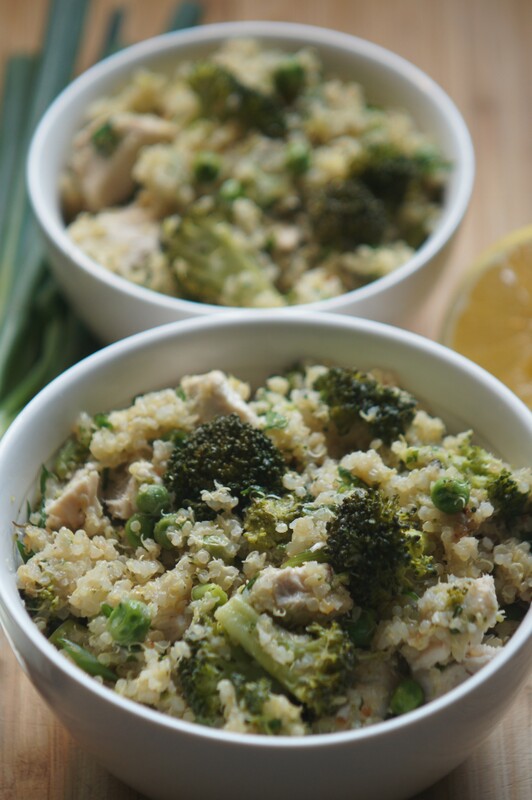 Warm Quinoa and Chicken Salad is perfect for lunch for the week. Literally just grab and go. You can heat it up in the microwave – but if you don’t want to because, say, a) the line for it is too long, b) the person before you heated up their fish dinner from the night before and didn’t cover their dish resulting in the microwave smelling like a neglected aquarium, or c) you’re trying to avoid being caught in conversation with someone that asks you how you are and when you answer cuts you off only to talk about themselves – then you can just have it cold or at room temperature. Martha Stewart’s recipe calls for asparagus, which I love, but I used broccoli – one of my favorite vegetables of all time. Actually, I never used asparagus for this recipe because the first time I made it it was Winter and asparagus wasn’t in season. I think I just got used to making it with broccoli. 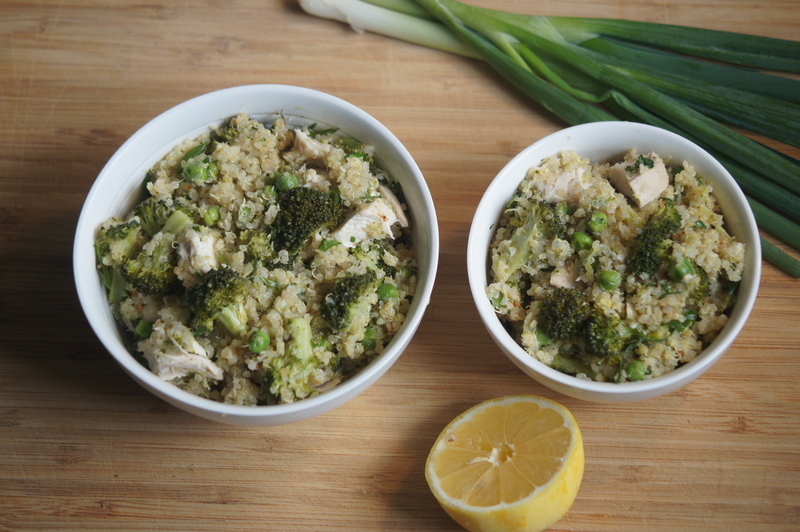 Though it was Winter the first time I had this and I felt like I was on The Night’s Watch with Jon Snow (drool…), this recipe warmed me up and made me feel like it was Spring because of the fresh lemon and peas. As I mentioned earlier, one of the reasons why this recipe is great is because everything comes together in one pot, which makes for easy clean-up. And there’s also no shame in eating straight from the pot as you’re listening to Drake. So I’ve been told. I’m glad I gave quinoa a shot with this recipe and I’m looking forward to making more things with it. In a medium saucepan, heat oil over medium-high. Add scallion whites and season with salt; cook, stirring constantly, until softened, about 3 minutes. Add quinoa and toast for about a minute or two. Place chicken halves on top of quinoa and cover with water. Bring to a boil, reduce to a simmer, cover, and cook 11 minutes. Add asparagus or broccoli, peas, and zest of one lemon. Cover, and cook until liquid is absorbed and vegetables are tender, 4 to 5 minutes more. Chop chicken into bite-sized pieces or shred. Add lemon juice and parsley, and season with salt and pepper. Sprinkle with scallion greens and drizzle with oil.